Thursday April 18, 2019 @ 9:30 a.m. 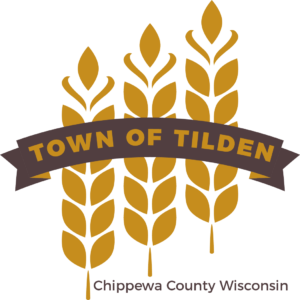 The Town of Tilden is approximately 36 square miles of hills and valleys located in Chippewa County adjacent to the northwest corner of the City of Chippewa Falls. The 2018 population of Tilden is 1519. US Highway 53 runs through Tilden with two exits into the town on County Highways S & B. County Highways F and Q run north and south through Tilden, while County Highways N, S, B and C run east and west. There is still 43 miles of roads the Town of Tilden is responsible for. “Tilden is Tradition and Tradition is Agriculture” sums up the rural character and personality of the Town. The rural landscape is hills and valleys with woods and farms. Dairy, beef, hogs, sheep, horses and cropping make up the agriculture. Traffic slows to accommodate farm machinery on the roads. Hay Creek and Duncan Creek empty into the manmade Tilden Mill Pond which flows to the City of Chippewa Falls. Residential development has been along these water ways. Establishments in Tilden offer camping, five bars that also sell food, a gun range, archery ranges, a baseball diamond, outdoor volleyball courts, a banquet hall, a Lion’s Club, 4-H clubs and St. Peter’s Catholic Church and grade school. The Chippewa Falls Post Office (54729) provides most of the residents with service, while the rest are served by Bloomer (54724). Phone service for most of the residents is provided by the Eagle Point (288) exchange, while Chippewa Falls (723 or 720) provides the south eastern portion with service. The Tilden Volunteer Fire Department provides First Responder emergency services and fire protection. The Town Office & Hall, Fire Station, Town Shop and Recycling Center are located at 10790 100th Avenue, Chippewa Falls, WI 54729.